Mr Heath was joined by publisher and editor John Martineau giving talks about at both sites about the monuments. 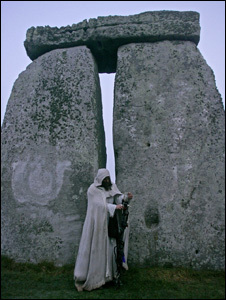 John Martineau, founder of the Megalithomania conference said: “The megalithic culture of western Europe left behind some vast and enigmatic temples, and yet there is little understanding of the cosmology driving their construction.” On solstice morning 9500 people flooded Stonehenge and 600 attended Avebury. No arrests were made at Stonehenge and two in Avebury. Eight co-authors and experts in their fields have contributed to the book to shed light on the original purposes of Avebury and other sites where stone circles dominate the landscape.